Dermawave can help repair hyper-pigmentation, scars, and sun damage. It is a non-invasive procedure which means there is no downtime for recovery. This is a huge benefit for professionals or people with busy lives. DermaWave uses LED emitters to target particular blemishes, wrinkles, and spots. 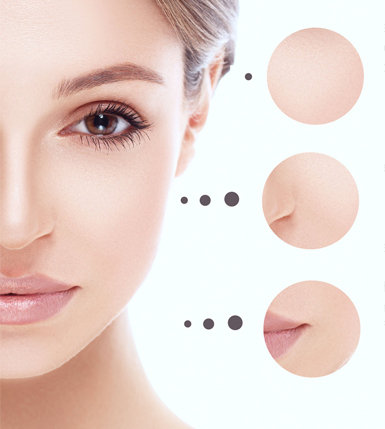 The procedure improves blood flow and increases circulation to enhance facial rejuvenation. Although DermaWave is an incredibly safe procedure, you should always make sure you are working with a qualified skincare professional when deciding what procedure is right for you. At Achieve Beautiful Skin we work with you and your particular needs to develop a custom skincare plan that will get you results. Dermawave, often combined with other treatments options are a great addition to most plans. All Skin Types – All Ages. Ultrasound is used to drive lipid-soluble vitamins, moisturizers, and healing agents deep into the skin. Without the use of Ultrasound, these important nutrients only penetrate very superficially into the top layers of skin. DermaWave ultrasound also forces collagen and elastin reproduction which gives our skin suppleness and elasticity erasing the signs of aging. Pair with SmartPeel™ Medical Microdermabrasion for amazing results! Our Most Popular Treatment! Our Medical Aesthetician will design a treatment regimen to suit your individual needs. This may include a SmartPeel™ Medical Microdermabrasion or chemical peel combined with the Dermawave™ Ultrasonic Skin Rejuvenation treatment (Minimum of $150 value). We highly suggest this treatment in a series and/or as a monthly skin plan. Packages and Memberships available, talk with one of our friendly staff members. Enables the repair process in the tissues deep beneath the lines above/below lips to repair simultaneously with the repair process occurring in the lip tissues. Helps promote the metabolism of collagen. Helps provides elasticity to connective tissues. What is Dermawave Ultrasonic Skin Rejuvenation? Dermawave treatments for collagen stimulation focus on the use of two separate energy sources delivered at the same time. A specific waveform of electrical energy is used to increase metabolic rate by as much as 5-7 times above normal. This results in a dramatic increase in blood flow and subsequent increases in fibroblast activity and collagen deposition. Ultrasound is targeted at deeper blood vessels for thermal effects, which also result in increased flow of blood to tissue. Both energy sources cause no injury or inflammation so the repair process is started immediately. What expectations should I have after my Dermawave treatment? When the treatment is over, your skin will feel refreshed, tight and firm. Results will continue to progress in the following 3-7 days; expect full results in 7-14 days. Collagen takes time to build and the results of the specialized gels and topicals we use also need several visits to repair the skin. You must also be diligent in using the homecare products supplied by your skincare professional. In skin care it’s important to know that, no matter what the procedure, there are no instant fixes. Long-term results are achieved when Dermawave treatments are performed regularly — one treatment can’t substitute for a series of treatments. The results are cumulative as your skin benefits from and loves regular care. Post-Operative: Ultrasound treatments speed up the healing process as well as maintain the results desired from any cosmetic surgery. Acne: The ultrasound vibration helps to break-up follicular deposits of oil, dirt and dead cells — a veritable breeding ground for bacteria. Ultrasonic frequency has been shown to kill bacteria and decongest the pores resulting in cleaner, healthier skin. Fine Lines & Wrinkles: Ultrasound helps stimulate and promote collagen and elastin production for more youthful skin. It also helps with hydration. The “plumping” of the skin fills out fine lines and wrinkles. Sensitive Skin: This is an excellent treatment for sensitive skin, even those with Rosacea. A hydrating, nutrient rich serum is used during the treatment. It is gentle and non-irritating. During the Infusion Phase, only products formulated for sensitive skin are used. No longer will your sensitive skin and/or Rosacea prevent you from exfoliating! The Final Result- is smoother, healthier and younger-looking skin, when used regularly along with an appropriate home care program. Who is the procedure not for? Those patients with a pacemaker or who are pregnant should not have a Dermawave procedure. Our Medical Aesthetician can advise you if Ultrasonic treatment is right for you at your consultation. Will the treatment be painful? What does it feel like? The Dermawave Ultrasonic Skin Rejuvenation treatment is relaxing and soothing. People have been known to fall asleep! There can be a very slight discomfort in areas around the mouth (especially if there’s metal present, i.e. retainers.) as the nerves there run deep. If you feel any discomfort, tell your Medical Aesthetician and she will turn down the energy immediately. One of the best features of Dermawave Ultrasonic Skin Rejuvenation treatment is that you may resume your normal skincare routine the moment your treatment is finished. Makeup can be applied immediately following your treatment. How often can I have this procedure? The Dermawave Ultrasonic Skin Rejuvenation treatment is safe enough to have on a daily basis. However, we suggest 10-14 days resting period between treatments. This will allow ample time for the treatment to take affect. Most people see results after the first treatment. The number of treatments required is dependent upon your personal beauty goals. We suggest a monthly treatment plan to assure constant collagen production and stimulation for a tight, youthful and glowing appearance.